I regret to inform you that an excellent pup has left us too soon. Zsa Zsa the English bulldog was 9 years old (the average life expectancy for bulldogs is eight to 10 years according to the American Kennel Club) when she passed away, NPR reports. 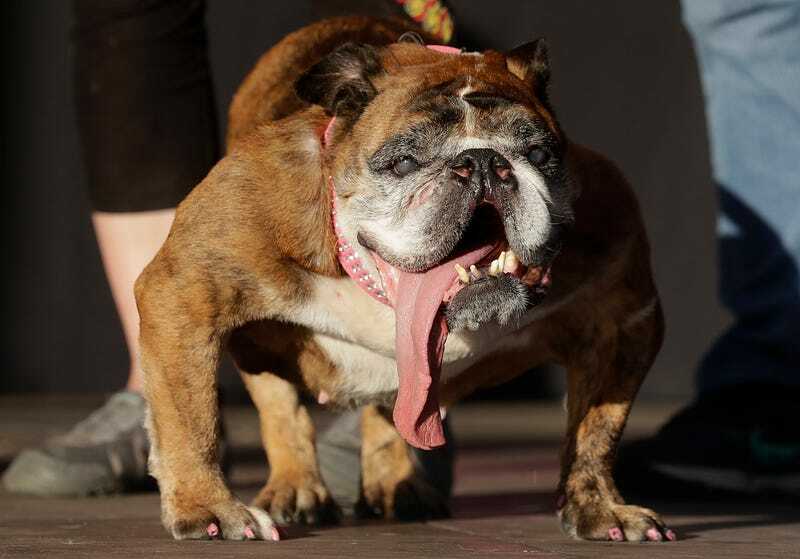 Only a little over two weeks ago, Zsa Zsa was driven 30 hours from her Anoka, Minnesota home to compete in the World’s Ugliest Dog contest in Petaluma, California, for which she won top prize—$1,500 and a trophy. Zsa Zsa, as you can see, has a very distinctive look, with abnormally protruding tongue and lower jaw. In fact, she even caught the attention of the New York Times, which totally wrote an obituary for her. She will be remembered for her love of pink and for sneezing in front of the judges while a Slim Jim was still partially lodged in her mouth.